One of the hottest business ventures right now, is publishing books on the Amazon Kindle platform. I've personally been curious about the prospects of publishing Kindle eBooks, but have never taken the leap. I've seen the huge success of Steve Scott with Kindle, along with many others. 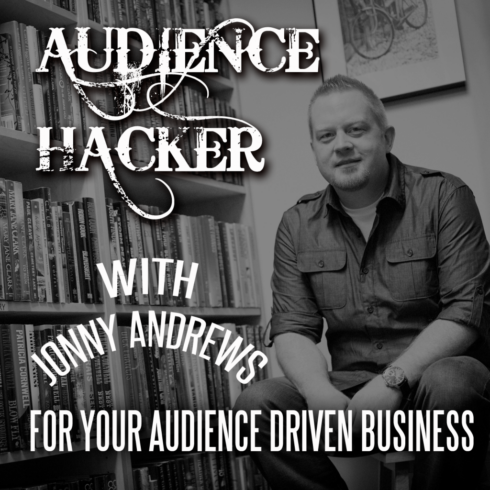 As a result, Perrin and I jumped at the opportunity to have Jonny Andrews of AudienceHacker.com on the podcast. We recently interviewed him and had the chance to dig into how he's been able to build a substantial business using the Kindle platform. What you will find below is Jonny's story and business tips for publishing on Kindle. The text below is a summary of the questions asked and answers given during the podcast interview. This is not a word for word transcript. What was Jonny doing before he was publishing books on Amazon? Johnny was trying to make his way in real estate investment. He was sleeping in his office, had no home, and slept in a wicker chair. He would bath at the gym that was across the street. He got a call from his underwriter saying that he had lates on his mortgage payment. And well, he didn't have a house. As it turns out, someone had stolen his identity and his credit was shot. He had to return to live with his family in order to make ends meet. However, this set back actually caused him to be extremely resourceful because he couldn't even get checking account. So, he learned how to actually start selling things. He learned how to sell things on the Warrior Forum…mostly selling SEO info products. He started to see some success and was able to grow this online business to over $1 million in sales. When Was Jonny Running the Internet Marketing Business? He started IM in 2006. His first launch ever was done from a hospital waiting room using a Playstation portable; because his girlfriend at the time ended up in the hospital the day he was supposed to launch. “How to Finally Live Debt Free and Wealthy” was the first book that Jonny wrote himself on Amazon. He was able to outsell Dave Ramsey, Suze Orman, and others and eventually get this book on the front page of Amazon.com overall. This success came after a lot of trial and error of publishing books written by writers he had hired. In fact, Jonny had published 450 books on Amazon and make all kinds of mistakes BEFORE his first successful book. So, What Made Jonny's First Book a Success? It wasn't because he was a great writer and certainly couldn't spell or punctuate. He discovered that his first set of 450 books obviously didn't sell well, because the content was terrible. The big change was that real people are reading these books and they want to read something that is interesting. So, with the first book he authored, he simply told his story and then emailed his friends and asked them to promote. Eventually the book reached a “buoyancy” point and the reviews and rankings made the sales more self-sustaining. However, somewhere along the way, Jonny decided that he did not want to be the Personal Finance guy, and so he actually unpublished the book. He then created an ecosystem where he only publishes books in one niche; he calls that ecosystem, “I love vampire novels“. How Much Success is Jonny Having with His Kindle ebooks? Johnny ended up creating a course teaching people how to publish kindle ebooks. Lots of people were selling courses on the Warrior Forum about how to publish on the Kindle; and the content was not good from these course. So, Jonny decided to create his course of how he was selling on Amazon. His course sold 3200 copies in 5 days. It did something like $450k on the Warrior Forum. He feels like he completely changed how people publish on Kindle. Then he did another version of the course and did consulting. He ended up doing around $1.2 million in 14 months. As far as publishing Kindle books, he had one book he launched called, “Pure Fat Burning Fuel”. They sold 15,000 copies in the first 7 days and made about $30k on that one book; and hit #2 on the Wall Street Journal. One of his students that bought his course did even more. This student made it up to number 4 of the overall kindle store. What is the Process of Launching a book on Amazon from A to Z? First of all, do not publish books across a wide range of niches. Stick with one niche (at least under each pen name). The reason this works is because your back catalog will be what fuels your growth. These books can also generate highly qualified leads; buyer traffic. You can then of course sell them upsells outside of the books as well. Write the book that you need to read. Solve your own problems and write a book. Also, look at what else is selling. Or even run adwords campaigns to the titles of your books. If you test these titles, you can greatly improve your sales. Any tips for choosing a great title? How to Lists. Or think about viral blog post titles; lots of great examples can be researched. What Do you Recommend for Actually Writing the Book? Do what you can do, and don't fool yourself. If you can't do it on your own, then hire a ghostwriter. It really doesn't matter if you outsource the book or write it yourself. Step 4 – Then for each the points come up with a story or anecdote. The introduction should be about your own life, but the other stories and anecdotes do not need to be about you. A good non-fiction should be 100 to 150 pages in print or 75 or so in Kindle version; which is about 20,000 to 25,000. How to Promote Your book on Amazon? First, you need to have some sort of platform: Facebook, Twitter, and Goodreads.com. Ask for reviews from friends and family. One tactic is to find reviewers from other similar books to yours and contact those reviewers and ask them to read your book and leave a review. These reviewers often have a small following and can lead to other reviews. Find podcasts to do interviews on and blogs to network with. How to Drive Readers to Your List? You can put calls to action at the beginning and end of books to join your email list. But always give them a video or something that they can't get through the book. So, periodically throughout the book pitch your free offer. A big part of publishing on kindle is just getting through the process for the first time. Just start publishing one to start and then you will learn the process as you go. What are the Tools and Mechanisms that Amazon Has to Help Publishers? First, use KDP Select which means you will be exclusive on Amazon for a period of time. Kindle Unlimited is a brand new option for Amazon readers to read unlimited books a month for just $9.99. Authors still get paid like before when these Kindle Unlimited users read their books. With KDP select, you can price your book as free every so often (Kindle Pulse). You will need to list your book on book discovery sites like BookBub.com and others. The Kindle Countdown is another great tool that you can use to promote your book. I have a question that is unrelated to the podcast though. It’s something that I struggle with when I’m building my nisch sites (and I think many others are too), but that I feel that you didn’t fully cover in the Nisch Site Project 2 (which is when I started building my sites). When you build your sites, how do you manager your writers? What sites do you find them at? Do you use the same once over and over again? What instructions do you give them (would be great if you could post them or what they include)? How do you make sure they keep deadlines? What do you pay them? I know you discussed this a little bit in the Nisch Site Project 2 (you had some problems with writers etc). But I would love to see more details about this and what is actually working for you. My problems are that most of my writers don’t keep deadlines and many don’t follow the instruction I give them (they are very detailed), so the posts usually don’t end up the way I want them. Is there a way to see Jonny’s books on Amazon? Searched his name and only one book comes up. I know that he does his books using various pen names. So, I don’t have any specific books that I know of. Great podcast! I jumped in on the Kindle eBook awhile back. Only have published a few titles under various pen names, so far. I outsource the writing of each book. I give the writer an outline and an idea of what I am looking as an end product. This method works so so depending on the ghost writer selected. I need to get back into publishing some titles. This was hands down the best podcast I have listened to all year. Johnny, I enjoyed your energy and humor so much! Thanks guys, you are really beginning to set the bar. Spencer thank you very much for yet another amazing podcast. I have been following you for sometime now especially the niche project 2 and I have a question I hope you wouldn’t mind answering. I found a niche that I’m really excited about and after doing much digging I found one niche site that looks like an authority site and the owner has put a lot of information on their site. My question is, how do you go about it i.e. do I start building my site regardless of the authority site or? Yep. If its a great niche; no reason you can be in the same market. Even if you never outrank them; being #2 is still a ton of traffic. Hey great podcast, and i have a quick question. I have a list of 10,000 domains in excel. And i want to find out the DA,PA,PR, etc. of each domain. So is there any software which can help me, thanks. Scrapebox for PR. Im sure there are bulk PA/DA checkers as well…but not sure off top of my head. What are the requirements for selling on the Warrior Forum? Can anyone make a product and sell it? I am looking to test out a software product soon and wonder if this is the best approach or should I try a different route. Seems like Jonny had much success on the Warrior Forum and I didn’t know if it was a good medium or not? Yes anyone can sell. The only requirements are to pay for the posting; you’ll have to check Warrior forum for current pricing and other requirements. Great interview. I can’t wait to interview him too. Good stuff. Quality makes a world of difference. I’ve tried doing the junk eBook market, like Jonny initially did, and got poor results as well. People want quality. When you put something out that’s valuable you see huge profits. Anyway, great podcast and I really liked listening to it. Its so hard listening to this. You literally allow the guest to say “blah blah blah” I made money. Yeah, TONS of value to the listener there. Sounds like his story isn’t legit. Too many holes. SO he just comes out of nowhere on WarriorForum and makes $60,000. Yeah, sure buddy. Again, you let him speed past an important detail. Thankfully he named his eBook. I’ve seen ads for that book. The guest was DOING MEDIA BUYS. He made money, but because you didn’t ask any questions no one who hears this will know what he spent to make that money. Terrible, just terrible. No value here at all, sorry. Yep, not one of my better interviews. I saw tons of holes as well, but I basically let him say his bit and will let the audience decide their own opinion. Dan, unsure about your attitude but its terrible that you did not get any value from this podcast. Perhaps, arrange an interview with Johnny for your own show and do a better job? I will be the first to come on your show and evaluate how well you do. Even Spencer admitted he did not do a good job with this one. You must be one of the types that believe everything online. Well, go homeless and make a million off the Warrior Forum using this interview, then I’ll take back my comments! This is probably one of the most amusing interviews done, Jonny is such a character. Its amazing to see the results that he was able to achieve after being homeless. The message from this is to keep on working towards your book, or goals, daily, and not worrying too much about hitting a home run from the first sentence that you write. I also agree on his approach to having an editor, or a small team, to help you achieve what you want. Similar to Dre’s attitude, consistency is also a theme here.